There are some things you need in life. Like milk in black tea. We’ve all had that awkward moment when you walk into the kitchen, boil the billy, pour the lovely steaming hot water over your tea bag, walk to the fridge humming away (you’re happy because you’re about to have a fantastic cuppa), open the door and bam. Humming stops. The milk isn’t there. You peer into the fridge, wondering if you need glasses (or forgot to put them on). You close the door. Open it again. Peer inside, a little more tentatively this time. Still not there. You blink hard. It’s still not there. You close the refrigerator door and back away slowly. Things are no longer right in the world. There is NO milk for your tea. Some things in life need milk. Like black tea. Other things can do without apparently vital ‘ingredients’. 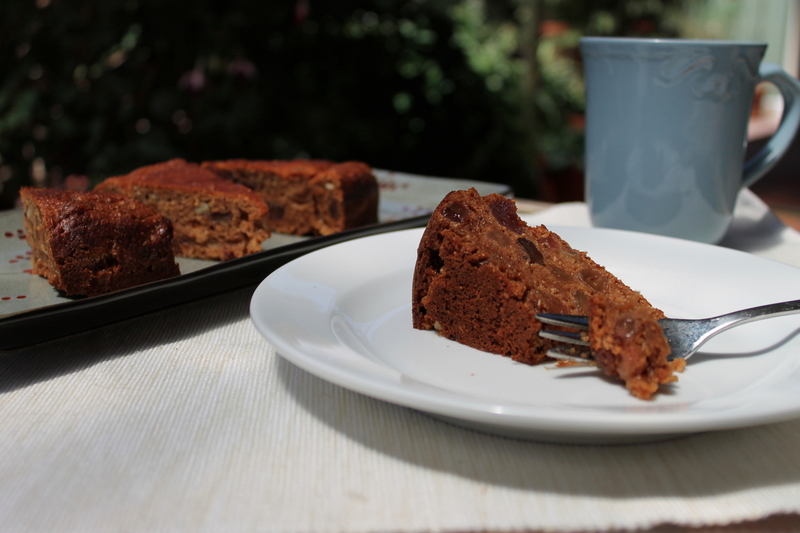 Such as this Sugar Free Fruit Cake. We’ll forget about the no-milk-for-the-tea scenario for now (a certain someone is still slightly raw about it) and move onto more exciting things. Such as the fact that this cake is sugar-free. Mostly. There’s always a catch, isn’t there? This one, however, isn’t too bad. I mean, there’s a wee bit of sugar in the mango syrup and of course sugar from the dried fruit, but hey we can’t be compete angels, can we? It’s also dairy free and void of any fats or oils. We’ve got wholemeal flour to provide extra fibre and a slight nutty flavour. A few eggs to bind it all together and hey presto, you’ve got one scrumptious fruit cake! 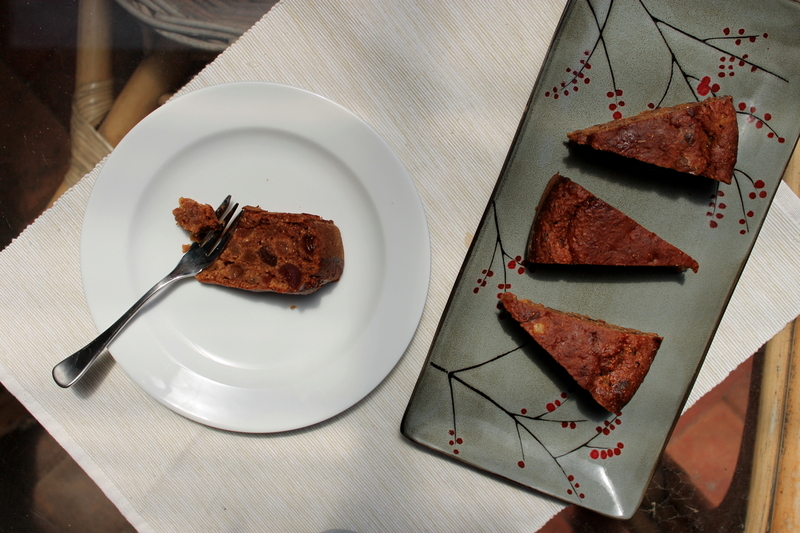 It’s far more moist than most fruitcakes (thanks to the mangoes), with a spongier, lighter texture. Due to the lack of ‘conventional’ sugar it won’t keep nearly as long as a standard fruit cake, however still freezes in a perfectly acceptable manner. Unlike the milk in your tea you won’t miss the sugar one bit! Makes one 20cm circular cake. Preheat the oven to 160C. Grease and line a 20cm diameter spring-form cake pan. Place the mangoes (juice and all), sultanas, mixed peel, glace cherries, dates, figas and water in a saucepan and bring to the boil. Boil for 1 minute. Transfer the mixture to a bowl and leave to cool for 20 minutes. Meanwhile, in a separate large bowl sift together flour, baking powder and bicarbonate of soda. Fold through the fruit mixture and then stir in the beaten eggs until well combined. Bake for 50 minutes or until a skewer comes out clean. If the top appears to be browning too quickly, cover loosely with some aluminium foil. Set the cake pan on a wire rack and leave to cool completely in the tin. Carefully remove from the pan and cut into small slices (or larger wedges if you’re feeling particularly peckish). Will keep in an airtight container for up to three days. Can also be frozen for up to two months.